Although it's a couple of finger lenghts on the map, it is quite complicated, but if you are traveling in good company it will be a great adventure and you'll look back at it someday with a big grin. For those wiling to reach deeper in their pockets, Croatia Airlines has direct flights from / to Athens during summer. They are not always displayed on their booking engine so do not hesitate to contact their customer service for additional information and prices. The distance between Dubrovnik and Athens is 438 miles (or 705 kilometres)and the shortest flight time is 1 hour 25 minutes. When you fly from Dubrovnik to Athens, don't forget about the time difference. The time in Athens is +01:00 from the Dubrovnik time. Lowest price one-way ticket was 107€ and round-trip ticket was 281€. Airlines flying directly from Dubrovnik to Athens are Lufthansa, Aeroflot, Austrian Airlines, Scandinavian Airlines, S7 Airlines, Aegean Airlines, UTair, Air Serbia and Croatia Airlines. If you are tolerant you can do the bus adventure, but bare on mind that along the coastline - the more south you go, the quality drops. It's fabulous, but the buses you need to take don't link up very well. It is supposed to be a 18 hour trip but it is impossible to complete it within that time-scale. The coastline route would be Dubrovnik - Budva - Ulcinj - Shkodra (by minibus across the border) - Tirana - Greece (more destinations possible as travel agents advertise buses running down. A "quicker" (less buses) option would be taking the bus from Dubrovnik to Skopje (Macedonia) and from Skopje the daily bus to Thessaloniki. BUT...(yes, there's always a but! ), the bus from Dubrovnik, organized by Hafet tours, only leaves on Thursdays and Sundays (departure at 23:00, arrival at 12:45). Once you reach Skopje, there are two buses a day by "Makedonija Soobrakaj" ("Macedonia Traffic") at 06:00 and 17:00. The good thing is that it takes about 4 hours (even less if there's no traffic) and the ticket price is around 20€. Highly recommended way is to catch a ferry from Dubrovnik to Bari (Italy) with Jadrolinija and from there catch a night ferry down to Igoumenitsa or Patra with Superfast ferries. The route is jointly operated with ANEK Lines. You do lose a full day but it is definitely a better, quicker, more comfortable and even cheaper option than travelling trough Montenegro and Albania on different bus lines. If your end station is Athens, it is recommended to take the boat all the way to Patras, due to faster connections to Athens. Once you are there, you have the option of taking a bus or train further on. There is also a highway connecting those two cities, so renting a car is another possibility. If you want to calculate your finances and thinking about going to Athens from Corfu, there are affordable flights starting from 120€. More information about Ferry timetable from Dubrovnik to Bari. You can check the prices and available dates of ferries in Croatia. 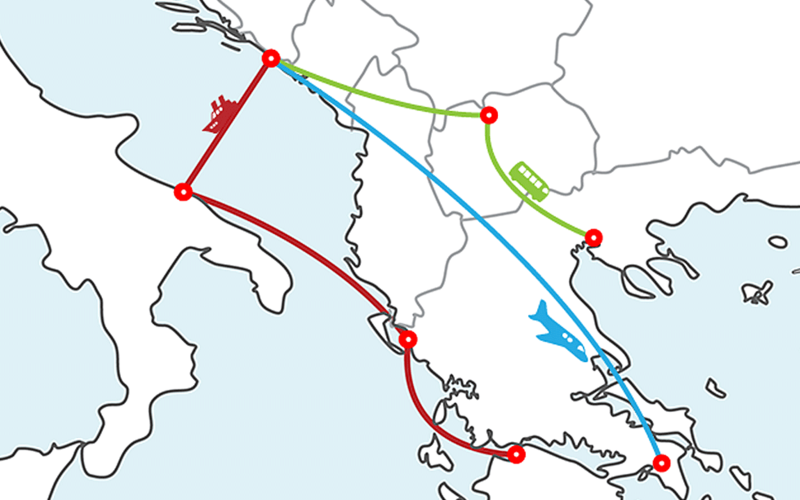 Need more ways on getting to Greece?